I have thrown a birthday party for John on his sixth birthday. The party was held at Play N Learn, One Utama New Wing. He wanted to have his party at Play N Learn instead of Kidsportz, his favourite indoor playground. I thought it was going to be easy in organizing this party. Boy, was I wrong? Not all the parents rsvp on time despite sending a reminder. Some cancelled last minute which was still tolerable. In any case, don’t expect everything to be smooth sailing when you organize your kids birthday parties. The children played 2 games, musical balloon and treasure hunt. 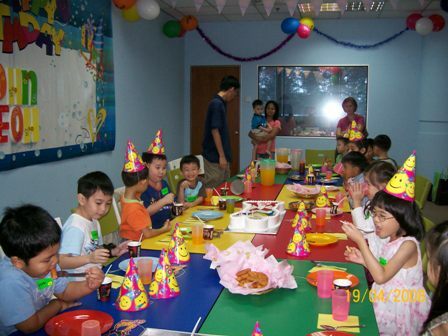 There was also a room prepared for the kids to have some snacks and cut the birthday cake. In the end, the boys were more keen to play the computer games while the girls preferred to draw. I hoped John had fun on his birthday party. My only disappointment was not being able to snap a group picture. Here are two more photos of the 3 musketeers. It is very rare that I can manage to get all 3 of them to smile in front of camera at the same time. So enjoy. Entry filed under: Family. Tags: play n learn.